The title of this blog “accepting the absurd,” is a moniker I’ve used in several places, so I’d thought I would use this first post to explain why I love this phrase, and what it means to me. “The absurd” is a philosophical concept at the heart of absurdism, which is a branch of philosophical thought, closely related to existentialism and nihilism. It is a reference to “to the conflict between (1) the human tendency to seek inherent value and meaning in life and (2) the human inability to find any. In this context absurd does not mean ‘logically impossible’, but rather ‘humanly impossible’. ” (Wikipedia) Absurdism was largely developed by Soren Kierkegaard and Albert Camus. I’ve never read any Kierkegaard directly -or much else beyond surfing Wikipedia pages- but I enjoy Camus’ version and interpretation of the Absurd most. For Camus “the freedom of humans is thus established in a human’s natural ability and opportunity to create their own meaning and purpose; to decide (or think) for him- or herself. The individual becomes the most precious unit of existence, representing a set of unique ideals that can be characterized as an entire universe in its own right.” (Wikipedia) I find this particularly inspiring for several reasons. First, it elevates the conscious existence to a fundamental role in the world. It doesn’t admit freedom as a permission granted by a government or by a society. Instead it defines freedom as a natural human ability. Freedom is in what you make of your life, the degree of someone’s freedom is not constrained by the world but rather by an individual’s own creativity, and in how they find meaning and purpose in their life. The notion that each individual is a universe in their own right is an idea I am very affectionate of. People are so vastly complex, that it is impossible to truly understand another individual (and perhaps yourself), yet we are a naturally social species. Despite the fact that we can never truly leave the subjective bubbles of our existence, we can interact in profound ways. I find my interactions with other individuals to be the most inspiring aspect of my life. Whether the interactions are intellectual, social, emotional, or physical, the fact that two existences can come together and take part in something that is contained within neither is nothing short of beautiful. For Camus, freedom, and beauty in life both came from accepting the absurd as a fact of existence, and not accepting by resigning to suicide, but rather by revolting against the indifference of the universe, and finding passion, by living life wholeheartedly. I grew up without ever explicitly thinking that there was an intrinsic purpose in life, although I never considered the alternative. For most of my life I thought that a purpose would present itself to me. I thought that if I waited patiently I wouldn’t have to look, that the ultimate goal of my life would be obvious. In a sense, I suppose that worked out for me. I don’t remember when I first thought or perhaps realized an objective purpose wasn’t something that I would discover. Whenever it did occur to me, I didn’t seriously consider suicide (philosophical or otherwise), in the way of Camus. However, the struggle Camus presented in The Myth of Sisyphus has helped me formalize that way in which I think about my life. I try to accept the absurd in the way I lead my life, I (unapologetically) take advantage the freedoms I’m afforded in my life to see as much beauty in this world as I can. I try to meet as many people as I can, I try to really learn as much about other forms of creativity as possible. For me the most troubling aspect of life is a different kind of absurdity. That is the human tendency to sympathize with others and the human inability to truly understand another individual. 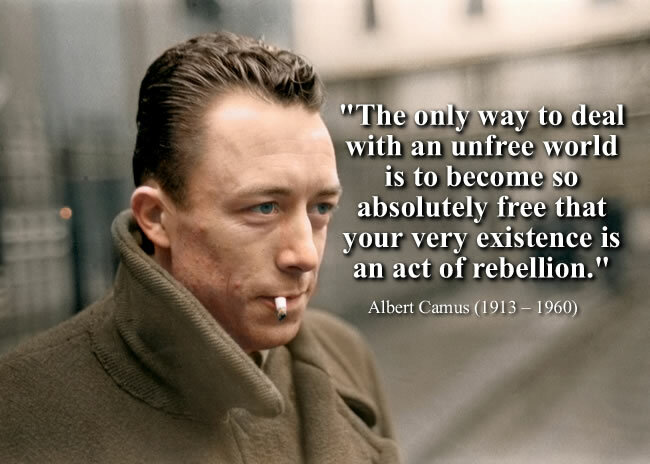 If you are interested in Camus’ Absurdism, this video is insightful. My interest in the absurd was sparked in high school by this Streetlight Manifesto track, but it might not mean as much to you. Next Who’s Paying for Peer Review?